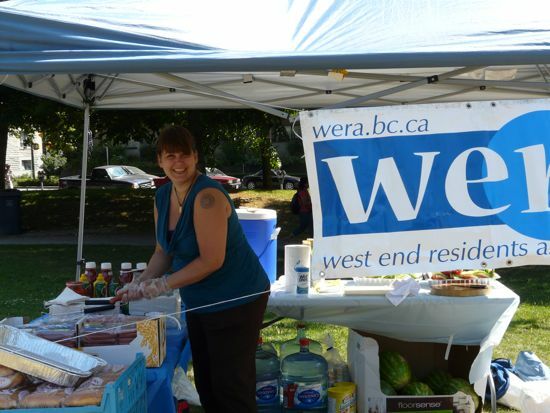 WERA bbq was a great success today. We served over 380 servings of hotdogs today. I met up with lots of old friends from WERA and many friends from the West End. Thanks to everyone who came out to say hi and have a hotdog and chat. Special thanks to WERA president Christine Ackermann (photo of her above), Spencer Chandra Herbert, who was working the grill hard all day, Cl. Andrea Reimer, Ron Goodine, Rob Wynen (former WERA President), Kati Ackermann and John Whistler for all their efforts today. I had a fund time pumping the dogs and tunes in Nelson Park. Tagged with: Cl. Andrea Reimer, Rob Wynen, Spencer Chandra Herbert.